When Middlebury College professor Allison Stanger briefed Hillary Clinton in October, she told the secretary of state she was providing “the Green Mountain view” on the federal government’s ever-heavier reliance on private contractors. A Vermont perspective, Stanger explained to Clinton, would afford an “outside the Beltway” look at the dangers involved in paying profit-making companies to perform publicly funded work. Stanger says her analysis was informed by “Vermont values” — specifically, the belief that citizens can and should shape government policy. Stanger, 49, had been invited to the State Department to outline her new book, One Nation Under Contract: The Outsourcing of American Power and the Future of Foreign Policy. It’s getting more attention and bigger sales than books from academic publishers (Yale University Press, in this case) usually generate. That’s because Stanger, 49, has latched onto a talk-show-ready controversy and unearthed information that frames it in stark, even shocking terms. It also didn’t hurt that Thomas Friedman plugged the book and quoted Stanger extensively in one of his recent New York Times columns. Blackwater may be the most notorious of those contractors owing to its killing of 17 Iraqi civilians in the center of Baghdad in 2007. Equally evil, but not as well known, are the security consultants who helped U.S. soldiers torture detainees at Abu Ghraib prison in Iraq. Private contractors also assist in targeting the pilotless drones that fire bombs and missiles at suspected militants in Pakistan. Such attacks, which have killed an estimated 300 civilians since 2006, are becoming more frequent under the Obama administration. Critics of this system of nonaccountability refer to the contractors as mercenaries. Some of them are conducting armed patrols, some are peeling potatoes, and all are being paid to do jobs that used to be assigned to American military personnel. The contractors are recruited by prospectors who roam the world, dangling the prospect of riches and adventure in front of young people who have little hope of advancement in their own countries. Thousands of Africans, for example, are working for American companies in Iraq and Afghanistan with pay of $600 or less per month — in contrast to the $10,000 or more that some American and European contractors pocket. It’s not just the Pentagon that retains legions of contractors, nor do they operate only in combat areas. One of the key points in Stanger’s book is that the entire U.S. foreign-policy apparatus — including its diplomatic, development-aid and intelligence-gathering arms — now outsources many bureaucratic functions. The same is true in the domestic realm. Consider the case of Lockheed Martin, headquartered in Bethesda, Md. This particular contractor now gets more federal money annually than do the U.S. departments of Justice and Energy, Stanger points out. And Lockheed Martin is doing more than servicing weapons systems; it also “sorts your mail, tallies up your taxes, cuts Social Security checks, counts people for the U.S. census, runs space flights, and monitors air traffic,’’ Stanger writes. The outsourcing trend began to accelerate during the Reagan years in response to the self-contradictory ideology of downsizing government while extending America’s global reach. The Clinton administration did nothing to slow the growth of a corporate sector funded mainly by taxpayer dollars but not directly beholden to the taxpayers’ representatives. In the aftermath of the attacks of September 11, 2001, contracting in the service of U.S. foreign policy brought bonanzas to thousands of spies-for-hire. Stanger notes that, following years of budgetary scale-backs, the CIA and other intelligence agencies lacked the resources to discharge the duties they were assigned in the Bush administration’s war on terror. Stanger emphasizes that there are advantages as well as risks to outsourcing aspects of U.S. foreign policy. She notes, for example, that the government saves money by not having to pay benefits to contractors, who can also be removed from the federal payroll as soon as their work is done. The author makes clear in her book and in conversation that she doesn’t oppose the contracting trend in principle, partly because she sees it as irreversible. Instead, she mounts an argument in favor of better management of private contractors. No media slouch, she has fashioned a sound bite — “smart-sourcing” — that encapsulates this option. 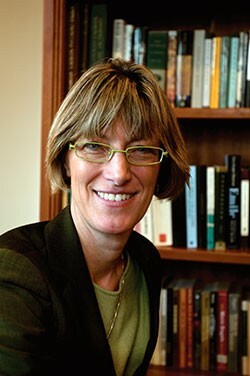 Allison Stanger came to Vermont in 1991 to teach in Middlebury’s political science department, where she joined her husband, Michael Kraus, the director of the college’s Russian and East European Studies program. The couple has two children — Hannah, a sophomore at Middlebury Union High School, and Jakub, a fifth-grader in the town’s elementary school. Both kids speak Czech. Their father was born in Prague, where they lived while their parents were working as visiting researchers in 2006-07. It was during a sabbatical in Prague a decade earlier that Stanger first noticed the United States had started outsourcing military training. She began looking into the use of private American contractors to train the Croatian army in the mid-’90s Balkan wars. Stanger’s initial academic concentration was on the Soviet Union. She earned a doctoral degree from Harvard for a thesis that related the decline of the Soviet empire to Moscow’s domestic policies. Idealism motivated her decision to study the politics of communism’s control center. “I became convinced I could help save the world by understanding how to avoid a U.S.-Soviet nuclear war,” she says. Stanger met fellow Harvard student Barack Obama on one occasion in the late ’80s and knew immediately that “this is someone who’s going to shake up the world,” she recalls. Now she speaks enthusiastically of an executive order Obama issued in March to initiate a government-wide review of contracting policies. Given her respectful attitude toward the president and secretary of state, Stanger is having trouble with the Obama administration’s plan to escalate U.S. military involvement in Afghanistan. Such a move, she warns, is not consistent with the president’s “vision and values.” He must surely understand, Stanger adds, that “what began as a NATO war has become an American war.” She believes the goal of containing Islamist terrorism requires a different approach. Tall, slender and scholarly looking, with graying hair and brown-rimmed glasses, Stanger grew up in Illinois and Indiana. Her father, a fifth-generation Protestant minister and a marcher in the civil rights movement, schooled Allison in ethics and activism. Her mother, an elementary-school drama teacher, passed along a love of the classroom. “I enjoy teaching and I feel privileged to work with Middlebury students,” Stanger says, describing them as well prepared and hard working. In a preface to One Nation Under Contract, she credits several Midd students for their research assistance. Stanger uses Facebook to stay in touch with former students, but confesses she does not use Twitter. Nevertheless, she plans to teach a course next year on the politics of social networking. Might that include a change in career — from teaching in Vermont to, say, working as a full-time advisor inside the Beltway? Stanger pooh-poohs the prospect of becoming a Washington wonkette. But she does smile slightly at the idea that Secretary Clinton might call her someday with a job offer. One Nation Under Contract: The Outsourcing of American Power and the Future of Foreign Policy by Allison Stanger. Yale University Press, 256 pages. $26.